AD signed up to our Fresh Meat Course in January 2018 and hasn’t looked back since. We asked AD about the course. 1. What made you want to join our Fresh Meat course? I grew up in Watford but went to school 15 miles away. I never had friends near by. I then went off to Sussex uni and while living in Brighton would see the Brighton Rockers every year at pride and they looked like the coolest chicks. Eventually when I came home after graduating and volunteering abroad for a year, I knew I had to get in on this Roller Derby thing. 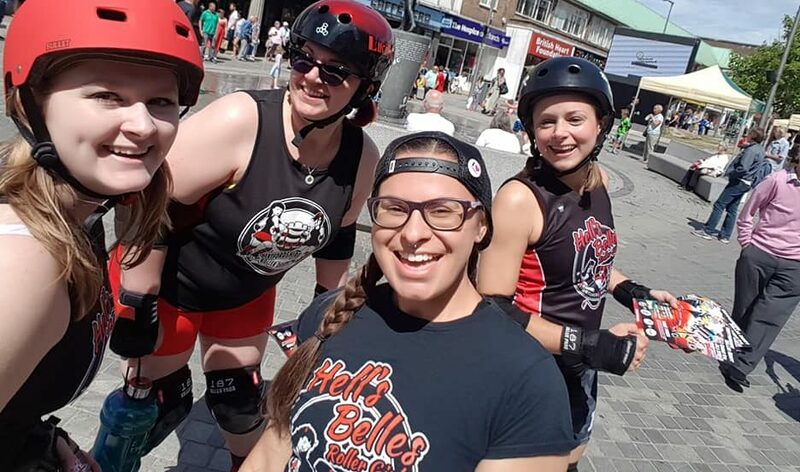 I didn’t really know anything about the sport so I did some Googling and found Hertfordshire Roller Derby trained 15 mins away and I haven’t looked back since. 2. What did you feel on your first day? I was in a panic leading up to it. I knew I couldn’t attend the first training session and I had emailed ahead making sure I would get rental kit for the second session. Everyone started to get ready and were comfortable rolling around and I couldn’t even figure out what velcro went where. Once I was kitted up I just went for it… and fell over A LOT. 3. What is your favourite memory? My favourite memory from Fresh Meat would have to be the final session. We all looked around and realised how far we had come. Then we took our skates off and attempted to play roller derby in trainers. It was so much fun! Though running around the track is way more exhausting than skating the diamond. After the session we had a little graduation ceremony where awards were given out. We had all voted in the weeks leading up to it for team spirit, future blocker, future jammer and best bruise/epic fall. I won the latter two which was amazing! It was really lovely to see that everyone had noticed the effort I had put in even if I did fall on my face pretty much every session. 4. What would you say to someone thinking of joining? Just go for it! Maybe go to a taster session and see what it’s all about and then just get stuck in! And then even if you don’t want to progress beyond Fresh Meat as a skater, you can become a Non Skating Official – it’s a family. They will be the first ones at your side when you face plant while attempting to sprint on skates for the time. Falling is all part of the fun. Find out more about learning to play roller derby in our Fresh Meat course.